In NYC? New Spring and Summer Tour Dates! In NYC? New Spring and Summer Walking Tour Dates! 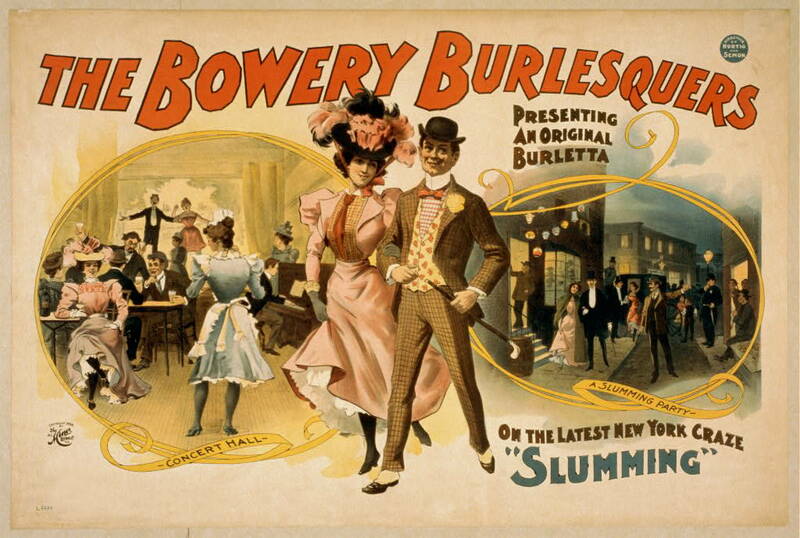 Above: A poster for a performance in the spirit of ‘the latest New York craze: slumming,’ in which wealthier NYC residents would go for an adventurous walk through the cities’ notorious slums. In the fall, we launched the pilot of our NYC walking tour: Fevernests & Firetraps of the Lower East Side. The idea behind these tours is to use New York City, our hometown, as a tool for educating New Yorkers about the initiatives that made the city what it is today, and for understanding that the Big Apple’s historic challenges were largely the same as those of developing countries today. In the spirit of the tours, we’re going to talk a bit about the housing types that defined the slums of the time. 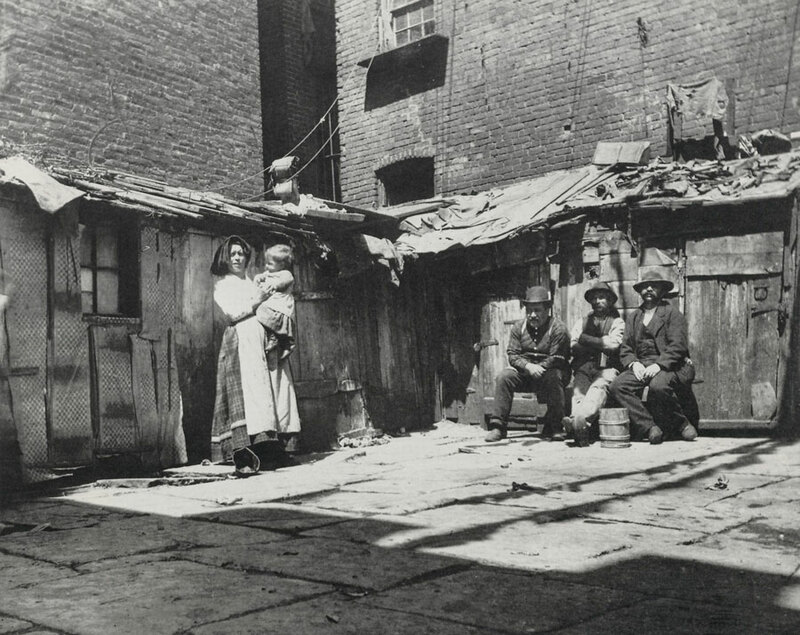 Shacks built amongst the tenements; 1890’s Lower East Side in NYC. Image Credit: Jacob Riis; How the Other Half Lives. For starters, even then the ‘shack’ was often the only option for poor city dwellers. In this case, the plastics and corrugated metal sheets that perhaps most define the slum shacks of today would be replaced by shabby wooden planks, mud walls and even floors, brick or stone when possible, and rags. For those who had the privilege of living within buildings, a most common and unpleasant living space was that of the cellar. These were particularly unventilated areas designed for storage that had close to no light. More importantly, cellars flooded regularly during rainfall, which would carry in all the drainage and sewage from the street, including that of the numerous outhouses and makeshift latrines. So, what exactly was the bathroom situation in our lovely hometown? You’re right to ask. Just for some perspective, in 1866, the Board of Health ordered 160,000 tons of manure to be removed from lots in lower Manhattan. That is roughly the weight of the MS Freedom of Seas, one of the world’s largest cruiseliners. The point is, people were using the bathroom everywhere BUT toilets, and in the absence of the Board’s drastic measures, that sewage either stayed where it was, or was progressively spread over the entire city by rains before exiting into the surrounding rivers and bay. 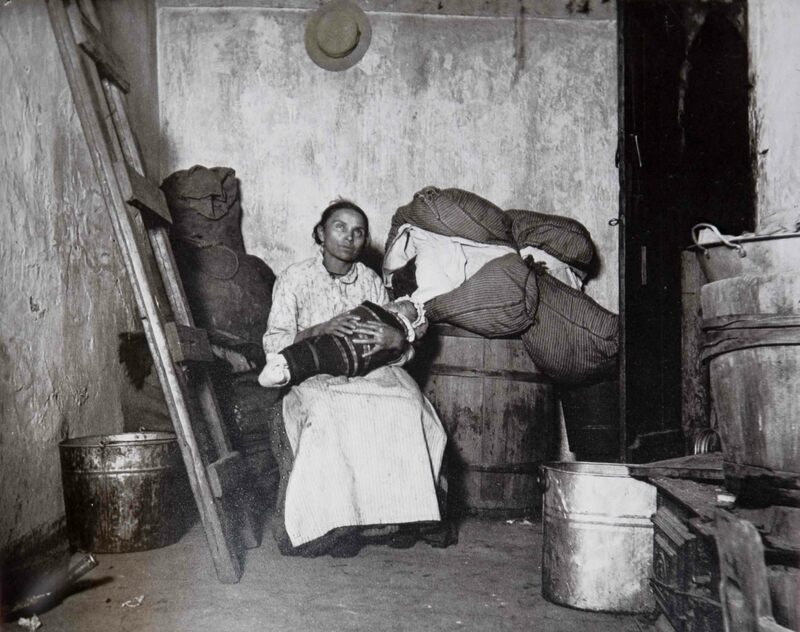 A woman and her child in a typical cellar dwelling; 1890’s in Lower East Side NYC. Image Credit: Jacob Riis, How the Other Half Lives. Next in the progression of housing quality were the tenements themselves. These dwellings, while providing some degree of separation from the mud and grime of the streets, had their own share of problems. Units that were once designed to be single family spaces were progressively converted to fit several families at once, with larger rooms being repeatedly broken into smaller ones, many of which had no light or access to ventilation. Lacking indoor plumbing, several families were often housed in just a few tiny rooms. The families themselves were often large and extended, including newborns and the elderly, and regular boarders were housed in order to help pay rent. These conditions were seen as a discomfort, an inconvenience of the poor, as they are often seen today. In reality, these conditions are deadly. An evolution of tenements. Image Credit: Jacob Riis; How the Other Half Lives. 2. The same made over into a tenement. 3. The rear tenement caves. 4. Packing-box tenement built for revenue only. 5. The limit; the air shaft—first concession to tenant. 6. The double-decker, where the civic conscience began to stir in 1879. 7. Evolution of double-decker up to date. That’s it for today, but stay tuned: we’ll be having more features like this as we get closer to the first tour date. We’ll talk more about how improving the built environment became a centerpiece of the city’s public health transformation, and the discoveries that fueled these changes. We’ll also get into some of the characters and stories that capture the spirit of New York cities’ past, and how disease played a part in every life and tale of the time. In the meantime, you can visit the tour website and reserve your ticket for any of our tour dates. The tours will take place every other Saturday, starting May 9th.